[Article supplied by Elspeth Mapp a member of the Torquay Pottery Collectors Society]. 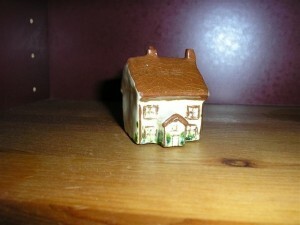 While on a spa holiday in Babbacombe in 2007 my daughter phoned me from a charity shop to say she’d found a ‘dinky’ little house which looked remarkably like the houses which appear on some of my Torquay Pottery Cottage ware. She asked if she should buy it – of course I said yes, although she explained it as being three dimensional and not a house decorated on any pot which made me a little sceptical. However, when she finally gave it to me I had to agree it was exactly the style, colours and glazes of typically decorated Cottageware but with no motto. It measures approximately 1 ½” inches wide by 1 ½” deep by 1 ¾” high to the top of the chimney stack. It is made from solid clay with no air holes, remarkable it did not shatter in the firing and has three little circles on the bottom where it would have stood in the kiln. The Potter/Decorator had taken great care in it’s modelling and decoration. Not knowing why or for what purpose it was made I took it along to the September 07 AGM and placed it on the Mysteries Table. I must say it attracted a great deal of interest. No one could say for sure exactly why it was made as no other had been seen but the consensus of opinion was that it is indeed Torquay pottery most probably Watcombe and most likely used as a paperweight as it weighs quite heavy for an item of it’s size. I have to say it is the most perfectly modelled three dimensional cottage with all the features of the best cottages [see pictures]. I am still thrilled with it and it will take pride of place in my collection as a very unusual if not unique piece. My daughter also likes it so much that I know this will be one piece of Torquay pottery that will be remaining in our family. If anyone can offer any further information about this unusual piece please let us know. We believe it was probably made sometime in the late 20’s early 30’s.